2 Fourth Avenue MASSIVE 150' OCEANFRONT LOT IN SOUTHERN SHORES! COMPLETELY REMODELED IN 2010! CUSTOM FEATURES AND QUALITY ABOUND! This is an absolutely stunning home in the highly sought after Sea Crest Village in Southern Shores. Never rented and very gently used by the owners this extremely unique home is one you must see. Features include one level living, 5 gorgeous master suites, one with a huge walk-in closet with custom shelving, 2 gas fireplaces, custom features including built ins, tray ceiling, cabinet faced appliances, and even a fenced in turf area for beloved four legged family members! Classic elegance spreads throughout the home with it's thoughtful decor and attention to detail. You won't find another home on the Outer Banks with the unbelievable views offered throughout the living room, bedrooms and kitchen. As amazing as the views are from the living areas, the kitchen may be even better! The views literally surround you almost feeling as if you are outside! The home also boasts a large walk-in pantry, wine cooler, a second living area off the kitchen, laundry on the main floor, a spacious captains watch with stunning ocean views, a bonus room on the lower level with additional workout space and a half bath, 2 garages, a cargo lift, electronic hurricane shutters on all east facing windows and doors, maintenance free trex decking, automatic water in the planters on the back deck and on the turf area, solar panels to keep the pool warm and also propane for the spring and fall. Located on a very private street with many second homes so the beaches are quiet. 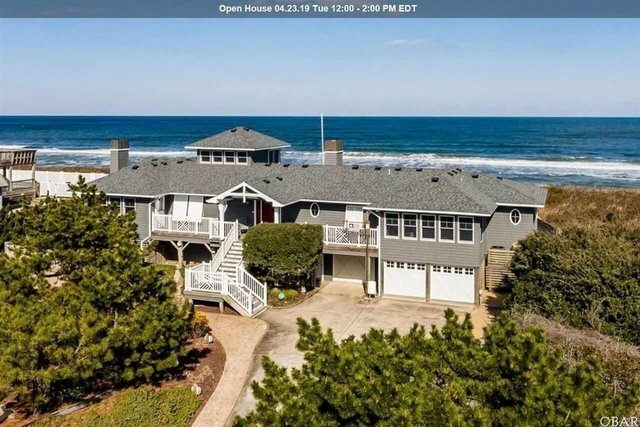 This truly is one of the most unique opportunities to own on the Outer Banks.